Are you traveling to the Slammer & Squire or King & Bear and don't want to bring your clubs? No problem! 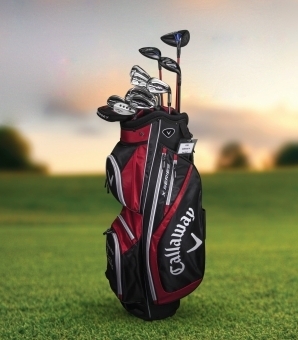 The World Golf Village Resort courses offer Callaway XR Rental Clubs which include a Troon Golf/Callaway drawstring pouch with 6 Supersoft Callaway golf balls. Keep the souvenir pouch for all of your valuables! Cost is $60 per rental for adults. Additional options of Regular and Stiff shafted clubs available for Men's (right) sets. Fill out the Rental Club Request Form below to reserve your rental clubs at King & Bear or Slammer & Squire.